Should the world give up, bow down and pay the ransom, or should we seriously ask the daring questions? (LONDON) - The world has almost become desensitized to hearing horrible news; there isn't a day that passes without being bombarded with horrific reports; of some killed in a street in Pakistan, more are blown up in a village in Iraq, a drone dropped over a wedding in Afghanistan, a child shot in the back in Palestine, a bomb exploded in Libya, a "new and improved" version of an Israeli threat to Iran…etc…etc. However, some types of news might still have some sort of an impact; the type that catches the eye causing it to flood with tears, the type that grabs the soul by the throat causing it to choke, the type that contains within an oxymoron; the kernels of extinction and the seeds of annihilation, the type that feels like throbbing, suffocating pain running through every cell of the body, the type that smells of burnt death, radiates with isotopes and gamma-rays and looks like dark smoky mushroom-cloud. On 27 April 2011, the Iranian Government computers were attacked yet again by the highly specialized aggressive computer virus, Stuxnet, a new generation of software programs that can fail entire production lines. The German cyber-security expert Ralph Langner, has been working to unravel the mystery of the Stuxnet virus. In March this year, Langner told his audience that the Stuxnet worm could be used as a "weapon of mass destruction against targets in the West"
In his speech, Langner warned of "the plot behind Stuxnet" calling its mode of operation "creepy." Langner called the programming of this virus a "rocket science". He elaborates: "It's way above everything that we have ever seen before".... The people behind it were "very professional, they knew all the bits and bytes... They probably even knew the shoe size of the operator" he added. "The virus was designed to work stealthily" Langner added. It was meant to take over the uranium-enrichment cascades at Iran's plant "slowly and creepily" and "to drive maintenance engineers crazy." "When we started our research on Stuxnet six months ago, it was completely unknown what the purpose of this thing was," he said. "We started to work on this around the clock because I thought, well, we don't know what the target is, it could be, let's say for example, a U.S. power plant or a chemical plant in Germany. So we better find out what the target is soon." "The idea here is not only to fool the operators in the control room. It actually is much more dangerous and aggressive. The idea here is to circumvent a digital safety system.... when they are compromised, then real bad things can happen. Your plant can blow up and and neither your operators nor your safety system will notice it. That's scary. But it gets worse - and this is very important, what I am going to say. Think about this: this attack is generic. It doesn't have anything to do with specifics with centrifuges, with uranium enrichment. So it would work as well, for example in a power plant or in an automobile factory. It is generic. And as an attacker you don't have to deliver this payload by a USB stick, as we saw it in the case of Stuxnet. You could also use conventional worm technology for spreading. Just spread it as wide as possible. And if you do that, what you end up with is a cyberweapon of mass destruction." "My opinion is that the Mossad is involved, but that the leading force is not Israel, so that... the leading force behind that is the cyber superpower. There is only one, and that is the United States. Fortunately... fortunately... Because otherwise, our problems would even be bigger. Langner, who only few months ago had named an unspecific "hacker underground" as the possible threat; at the end of his presentation, he appeared as if he was avoiding -to solely and directly- implicate the the most likely culprit, namely, "Israel". He seemed to arguably play down the "Israeli" role behind this threatening danger as he hinted that "Israel" is ONLY PART of the danger rather than it -with all its known genocidal record, supremacist ideology and repeated threats- being the MAIN DANGER and the major concern for the entire planet. Beautiful... isn't it! "Israeli" company had "secured" the security system at Japan's Fukushima nuclear power...! What is the best way to protect your sheep? The logic of these days appears to be; of course you entrust them to the wolf. Knowing the history of this terrorist state that was created by terror, that continues to exists by methods of terror, yet it somehow poses itself as an oasis of democracy, a beacon of morality, and a founder of civilization, that it fools and seduces the world into appointing her as the world's security guard is simply beyond belief. Don't you wish it was only Palestine?! By its violent acts of hostility and aggression against many sovereign countries, hunting people around the globe with impunity, behaving like a mad dog and acting like a “master” bully, the "Jewish state" systematically continues to terrorise the world and all its inhabitants. Coercing individuals, organizations, and nation-states … Intimidating entire populations with annihilation... Threatening whole civilizations with destruction....... 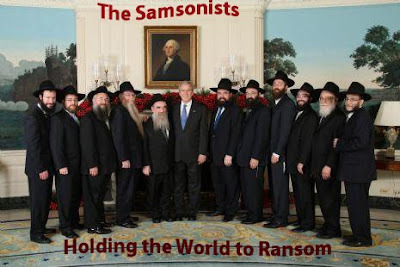 The “Jewish state” is holding the world hostage… and for what price, what ransom? The ransom we pay is dear, it is the slaughter of all concepts of justice, equality, compassion, civilization and peaceful coexistence, basically everything developed and cherished by humanity through millennia of progress and evolution. Should the world give up, bow down and pay the ransom? Who will stand up to this monster? Who will speak out against those mass-genocidal psychopaths? Who will prevent those ideological-creeps from destroying what is left of our beautiful planet? Who will dare to act and stop the mad Samsonists before its too late? Nahida Izzat is a Jerusalem-born Palestinian refugee who has lived in exile for over forty two years, after being forced to leave her homeland at the tender age of seven in 1967, during the six-day war. She has a degree in mathematics, but art is one of her favorite pastimes. She loves hand-made things and so makes dolls, cards, and most of her own clothes. She also writes poetry, participates in written dialogues and believes in building bridges, not walls. She started writing when her friends insisted she should write about her memories, experiences and feelings as a Palestinian.When she did it all came out sounding—she was told—like poetry! So she self-published two books: I Believe in Miracles and Palestine, The True Story. Her dream is to return back home to a free and liberated Palestine.